PUSH number 16. West Ham’s latest pin up girl, Debbie, on the cover *drool* and in full colour, really brings out those sky blues. I see the fist and know Tim Wells is in the house. The Column Inches. Could be about a woman, could be about West Ham, either way love is confusing and his piece is solid and self knowing. Zines bring out the real in a sugar coated saturated mainstream. Nothing could be truer than when this harsh play by p.a.levy turned my gut one page in. A hard hit. “I’m electric, the ghost is cold” Someone so hurt, that their idea of love is a “far flung magical kingdom” shocked me in Deeds Not Words In Five Acts. Mesmerised by the pain, repulsed by the realities. For a few moments, I had to look at buildings, to stop the images I had just witnessed. Then I read it again. Compelling. I moved locations, and settled into the sun to see where else Editor, Joe England, would take us. No amount of light was going to save me. I was now resigned to the fact that I was going to be entering into these writers dark matter, this wasn’t going to be easy. Anette Roller’s maternal word beauty lifts her character’s predicament of lies and promises, pain and rage in Handsome Devil, when madness enters the room. I’m seeing a theme, or maybe not. All I feel is trepidation, like a curry, hot, the flavour too good to surrender from the heat of it, I continued. Simon Dent’s Gunships sad truth and Michael Pederson’s crazy pub convo in …Meadowbank, poignantly leads into Geraldine Quigleys, The Mark Of The Hydra. Religion, politics and grudges, how punk saved the life of a boy from Derry. This issue has a cheeky centre in Jenni Doherty. Strange String Fellows, a symphony of saucy poetics, gongs, strong. Onto Ian Cusack and one hell of a lucky bugger in Them That Are Carried. It is an excellent story of one man’s walk through life. Peter Burnett’s There Are No Apple Bastards In Larkhall laments sectarian songs, still fighting old battles that chant forever. Michael Keenaghan‘s Easy Money like a modern kitchen sink, dramatising the young, desperate and gullible. It left a sadness in my smile. I’m beginning to discover what a terror Dean Lillyman must have been or still is. Shenanigans written with his unique perspective is wonderful, misspent youth revisited. This issue is filled with ‘right dodgies’, and no better than characters Darren and Wayne in The Chain. This has Joseph Ridgewell‘s fingerprints all over it. A test of ‘just how fucked up can I make this character?’ which leads to ‘just how fucked up can he make my mind?’ as I hop on city rail home. Now, every face I see has a sordid secret and a soundtrack to go with it. Ford Dagenham’s Laugh Our Death Away, should be sung, so emphatic, so true. Then there is Amelia by Martin Hayes. Unobtainable and tragic, suddenly I see a theme again. Is this love? 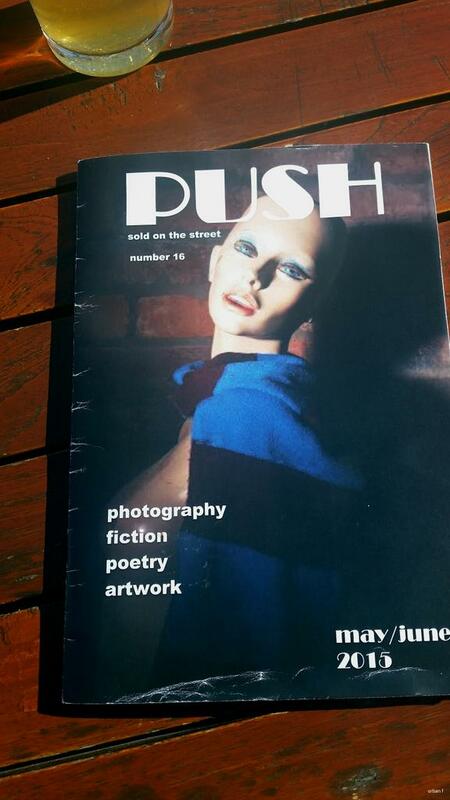 Once the cover closed on PUSH sixteen, its heartsick voice squeezed back inside its sleeve. Fifty odd pages stayed in my mind for a long time, a few more authors discovered, more words I must find. A short note on images. The cover photography of Hukins/Lilleyman. Individually they have their own fresh eyes, their passion for it shows. Jose Arroyo’s intricate woodcuts displayed in this issue in panels, a collage of deep emotion. The nicks in the wood, his heart shown. Always worth a walk and wander is the photography and work of Paul Talling and his love of derelict London. Remember short press runs means get in quick!